Tight Lines has many years experience fishing the Bahamas and hosting trips to Andros Island. Without question, Andros Island is the bonefish capital of the Bahamas. Not only is Andros known for its large bonefish, it also known for its vast/extensive flats, top notch guides, fantastic food, and great people. We are very excited about this new destination because it brings all of these features together for the fishing vacation of a lifetime. Swain's Cay Lodge is newly built and located on the east side of Mangrove Cay. Sitting steps from the water, Swain's Cay Lodge overlooks an ocean bonefish flat. In addition, the new construction offers clean, comfortable, air conditioned accommodations with attention to detail. The Bahamian cuisine is remarkably delicious, however it can be altered for those who may have dietary needs or if he or she is particular about what they eat. For those who have already enjoyed Bahamian cuisine, the food at Swain's Cay will surprise your taste buds! 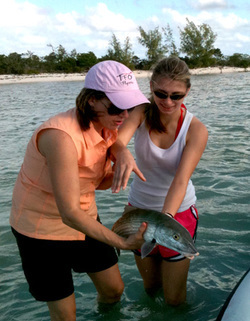 Swain's Cay Lodge has handpicked the best local independent guides who have bonefish in their blood. Whether you want large numbers of fish in the 3-5 pound range or would rather hunt single and double bones of 6-10+ pounds, the guides know just the spot for the wind and tide conditions. There are flats on Andros for all bonefishing objectives – some with enormous numbers of fish where you will see school after school, others where the fish are in pairs or cruising alone, and these are usually the big ones. 20+ fish days with an average size of 4 pounds are certainly not uncommon here and seeing 10+ pound bonefish is nearly a daily occurrence. As part of our commitment to help our customers learn and grow with the sport, shop owner Andrew Moy will be offering free instruction during the late afternoons for those who would like to brush up on their casting skills as well as their approach to pursuing bonefish on the fly. Andrew has 20 years experience fishing in the Bahamas, teaching fly casting as well as the skills necessary to be a successful flats fisher. We hope you'll join us on this exciting trip during April of 2018! Contact us to book or get more info on the Andros trip.